As the name suggests, tent stoves are built with tent use and camping in mind, offering the ability to stay warm and heat food or water while minimizing your exposure to the elements. In this guide we’ve taken a look at some of the best tent stoves on the market to let you generate heat on the go and keep the cold at bay, whatever the weather. Whether it’s for pleasure or as a matter of necessity, camping in challenging climatic conditions can be a tricky business. If you find yourself pitching shelter in a cold environment, a high performance expedition or cold weather tent is going to go a long way to making things easier but there are always going to be other considerations that need to be taken into account and top of the list is generating heat for warmth and cooking. The primary role of a tent stove is ultimately to allow you to quickly, easily, and safely generate heat when you’re camping. The secondary role once this is achieved is of course, to allow you to heat food and water. With this in mind, a high quality tent stove is a natural component not only to an outdoor camping loadout or bug out plan, but also as a redundancy in any home preparedness strategy, allowing you to maintain a level of readiness at all times. 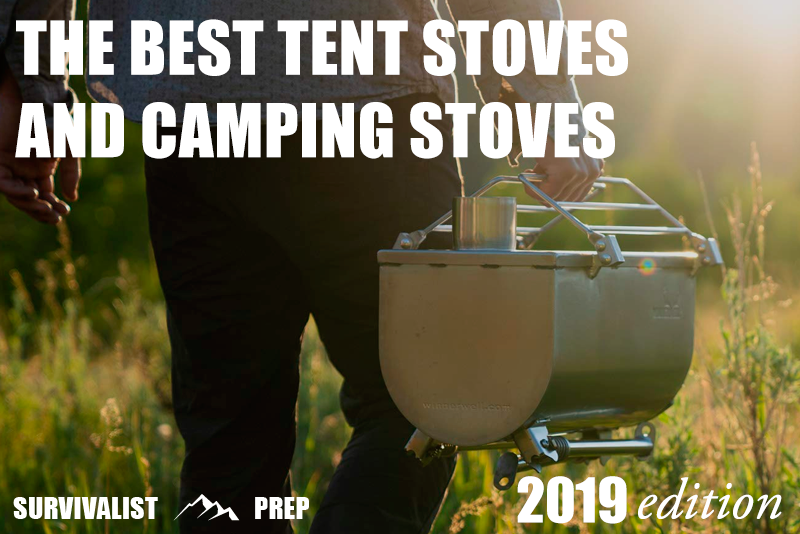 When it comes to choosing the best tent stove for the job, the good news is that there are only a few essential considerations to keep in mind and questions to ask when finding the best solution. How large is the tent or shelter you intend to use it with? Many of the best tent stoves and camping heaters will clearly address these questions in their design and outside of these areas the biggest fluctuations between various options will revolve around the number of additional components or accessories they come with. We’ve taken a look at the best tent stove solutions on the market to help you find the best fit for your requirements. Whether you’re looking for a stove that you can throw in the back of a vehicle, one that’s light enough to carry on foot, or a heater that you can call on at home if the grid goes down, we’ve covered every angle. This wood fired tent stove is built with galvanized steel with a heat-resistant finish to maximize its ability to cope with high temperatures. On top of this, the design utilizes a hinged door constructed from cast iron with the addition of easy-control ventilation holes to manage the stove without any fuss. 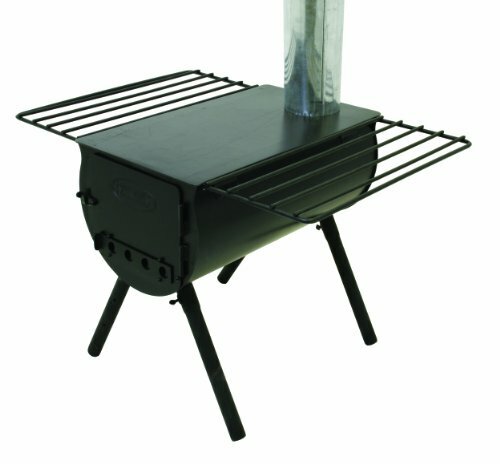 Detachable legs and nestable pipes allow the stove to pack inside itself for maximum portability which is a real bonus if you’re looking for a tent stove that’s easy to store and transport. The top platform of the Guide Gear stove is perfect for keeping pans hot, allowing you to boil water and cook food on a solid surface that makes short work of the task. The Winnerwell Woodlander is undoubtedly one of the best tent stoves on the market, delivering that perfect combination of performance and portability that make it the natural choice if you’re looking for a camp stove system that’s designed to grab and go. Built from 304 stainless steel, the Woodlander’s construction is designed to be durable meaning it wont corrode or rust in even harsh outdoor environments. As a recreational wood burning tent stove, the Woodlander is ideally suited for use in small spaces and shelter situations including canvas tents, teepees, and shacks. 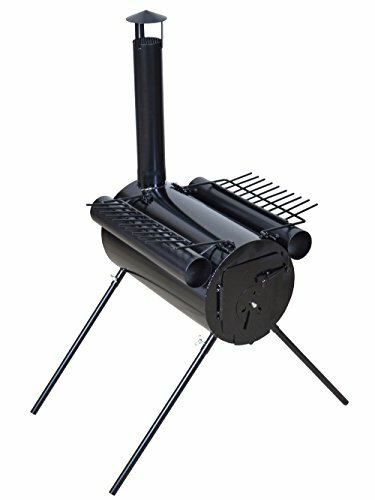 In terms of portability, the Woodlander features a 4 folding leg design that collapse flat under the stove while the chimney pipe sections can be disassembled and packed within the stove body itself. Combine this flat-pack design with side shelves which double up as carrying handles and you’ve got a tent stove which is ideal for carrying when you need to move out. A steel wood burning cylinder stove designed for heavy duty use, the Alpine CS14 is well suited for use in a range of back country scenarios whether you’re out in a suitable tent or a cabin. The Alpine CS14 comes complete with a damper, internal log grate, spark arrestor, and accessory shelves as well as five-piece nesting pipe. When it’s time to move out, everything is designed to pack up inside the body of the stove itself for quick and easy transportation on foot or into the back of a vehicle as well as making storage a piece of cake. A generous cooking surface combines with a door damper to minimize cooking stress, making the job of food prep when camping a simple affair while the stove itself is designed to incorporate an additional wood stove water heater with space to store this when done. This wood fired camping stove is a great choice if you’re looking for a multi-purpose tent stove for carrying out any task from cooking your food to heating your shelter (and yourself). A compact form factor makes this stove a good option for vehicle transport as well as integrating a design that makes it easy to carry and store. 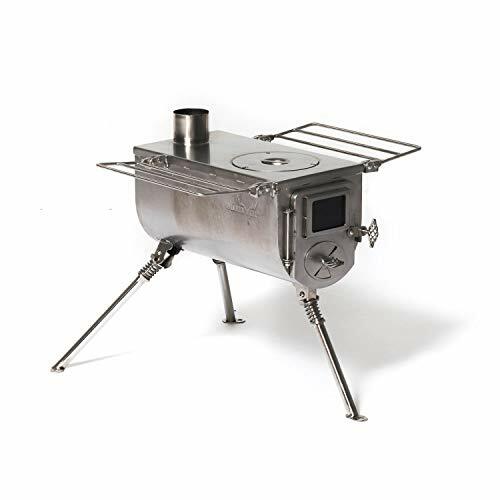 Utilizing a rolled steel construction, the TMS Portable Military Camping Wood Stove is super durable while remaining simple to assemble, use, and pack up when you’re done, with the whole thing fitting neatly into the stove body while the hinged top grate doubles up as a carrying handle. 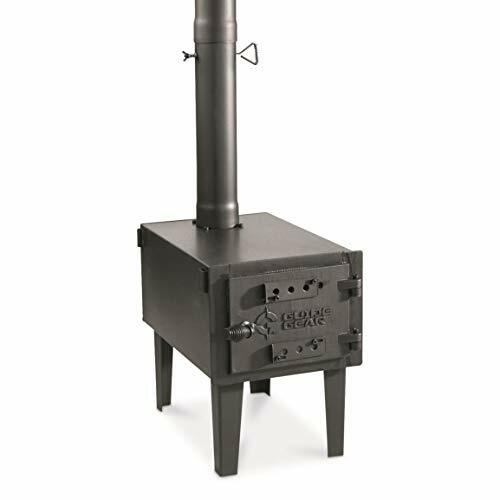 In terms of features, the TMS stove includes a spark arrestor for additional safety, removable cooking tubes on each side of the stove, front and rear air flow regulators, an easy-access tray for removing ash, and stove tools. Weighing in at a mere 17lbs, the EcoZoom Dura is a lightweight survival stove that’s built to run off of whatever biomass fuel you have to hand, allowing you to build up serious heat quickly with just twigs, leaves, and larger branches or wood fuel. While slightly different to other stoves in this guide, this camping stove is an excellent choice if you’re looking for a system that will get you cooking in next to no time in either an outdoor or emergency situation where you need heat quickly. 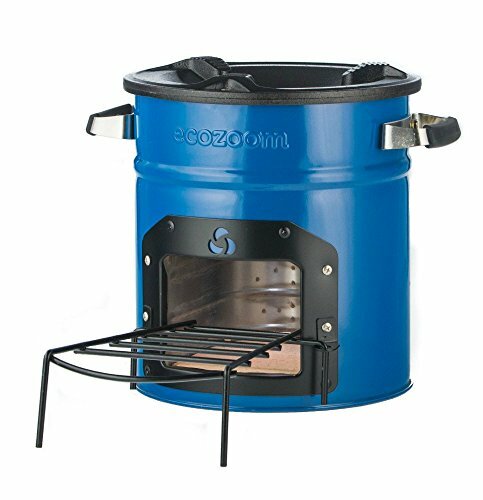 A rocket stove design means the EcoZoom Dura uses minimal fuel to get up to heat and is highly efficient when it comes to cooking quickly, allowing you to cook an entire meal with less fuel. The Dura features a number of useful design additions that make it well suited to practical use in a variety of situations including stainless steel side carrying handles wrapped with silicone for grabbing even when hot. With all of our guides, we reference as many expert sources, real world user opinions, and verified reviews as possible so we’re able to provide the most relevant and educational information on finding the best emergency generator systems for every situation. Choosing the best tent stove is never a one-size-fits-all activity with individual budget, specific requirements, and personal preferences sometimes varying considerably between people, locations, and uses. With these considerations in mind, this guide looks to provide advice on our own opinions of the best camping stoves and outdoor tent stoves available today, however, it’s always important to carry out your own due diligence to find the best solution for you when deciding on a tent stove solution that’s the perfect fit for your situation.